Jill DeWit: I’m Jill DeWitt, broadcasting from sunny Southern California. Steven Butala: Today, Jill and I talk about the three biggest challenges of our land careers. Finally, we get to talk about some regular topics again. Jill DeWit: I know. I can’t wait to hear yours. Steven Butala: Into this, 28 days. Steven Butala: With 1.2 million. With members. That’s not our deals. That’s the members … Deals we’re funding for our members. Steven Butala: Anyway, let’s get back to these challenges. Steven Butala: Before we get into it, let’s take a question, posted by one of our members on TheLandInvestors.com online community, it’s free. Steven Butala: So far so good. Jill DeWit: Right. “The county records online say no improvements exist on the property, but I look it up on Google Earth and ParcelFact there’s clearly a house on the property. I went back to 1995, the earliest satellite images available on Google Earth, and the house was on the property. My offer, just shy of $2,400. The only property taxes due are for 2018 for $187. Is this deal a good or bad thing?” I think it’s a [crosstalk]. Steven Butala: I think you actually won the lottery. Jill DeWit: Yeah. “What about the title issue of the wife being deceased and not being able to sign the deed?” Thank you. Steven Butala: Well, that’s a different matter entirely. Jill DeWit: On the title part. Steven Butala: That’s the case. In certain states, you need to file an affidavit, it’s very simple. California for example is incredibly simple when someone’s deceased to do that. Arizona, it makes it a little more difficult. The fact that there’s a house on this property, now because there’s some money involved and some potential, makes it worth the effort and the time and the expense and the learning curve to undo this, whatever it is. I think. We should always be able to undo this. It’s just a matter of time and money. Jill DeWit: I think the big picture that I think it’s Dustin is asking here is, is this worth doing it? The answer is yes. Jill DeWit: Finding something on the property is not a bad thing at all. If anything, it … 99% of the time it’s a good thing. It’s a plus, and they clearly don’t care. Even if it’s a falling down something. One of our members has a great story about people finding the falling down cabin and actually cleaning it up, fixing it up, and moving it in with their kids and putting their kids in school there kind of thing. It’s something that they can start with. A, it makes it a little more special and worth a little bit more in the end, so I think it’s wonderful. Steven Butala: If you go on LandWatch or Land and Farm or even the MLS and you scroll through all the lands listed and it’s land, land … Picture of a land, land, land. Boom! Then there’s one with a trailer on it, even if it’s trailers falling down, the trailer’s worth a thousand dollars max. Now you’ve got … You’re at a whole different … Now you’re selling something that’s a piece of property and you’re clearly showing potential. Jill and I have put old trailers on properties in the past just to make ’em stand out and they sell immediately. Jill DeWit: Right, to show it’s possible. Steven Butala: This is a good, solid question. It’s a great question and very helpful actually in this environment. We have a bunch of really … A bunch of new people right now, and if there’s stuff on your property, hopefully it’s not a Freon-leaking refrigerator. Jill DeWit: That we don’t want. Or the remnants of a gas station. We don’t want that. Steven Butala: Yeah, or all kinds of stuff could be buried. There’s a lot of things that could be out on rural, vacant land. Jill DeWit: Exactly. Native American artifacts. Don’t really want that. Steven Butala: If you want to have some fun and you’re new, go out to land investors and ask this question. What have your more senior people found on your property that’s surprised you? Jill DeWit: Wouldn’t that be hilarious? That would be hilarious. That’s good. I know what you would put down. Jill DeWit: A bunch of tombstones and a fence, ’cause I actually bought a cemetery. There’s [crosstalk] one. Steven Butala: I actually bought a cemetery by accident. Jill DeWit: Yeah, oops. Found that on my property. Steven Butala: That’s a story for another time. Steven Butala: Today’s topic, the three biggest challenges of our land careers. This is the meat of the show. Jill, you have a list? Jill DeWit: You want me to go first? Steven Butala: Or we could go every other one, but no. You just run through yours. Steven Butala: I want to hear this. Getting from the county to the mail? Jill DeWit: County to the offer, for me. You know how I solved it? I have you. I came in, obviously, not having to get over that hurdle. Steven Butala: You mean to actually put an offer campaign in the mail? Steven Butala: All the owners get it? Steven Butala: They call you? Jill DeWit: Right. I’m just saying … Say about branding this career. Let’s just say I’m branding this career or their other career, for me that would be the part that I have to study the most is picking the county and getting offers in the mail. I understand the whole process, I know how to do it now, right? In the beginning … It was great because I had you. I didn’t have to think about it. No big deal. My number two was running out of acquisition funds. Don’t have that problem anymore, but that was a challenge at one point in my land career was I only had so much money to spend and shucks, sometimes we had so many great deals, I was running out of money. I’d had to really get strategic about trying to quickly sell something so I could quickly buy something and not lose the deal kind of thing. That was a challenge. Now it’s solved, obviously, for us and our members. That was something. Steven Butala: That’s pretty big of you to admit that. Jill DeWit: Thank you. Thank you for saying that. It’s true. Jill DeWit: I know, and let ’em fall down. That was hard for me, is learning to let them fall down ’cause if I run around picking up the pieces and running around behind everybody and double-checking everybody’s stuff, we’re never gonna get anywhere. That’s why I want to share this with everyone here because as you grow your business, you might have that as well. You’re so used to doing everything and overseeing everything and being a part of everything. So many of our members are doing this in their home offices in the evenings and the weekends and doing all the work. When you can finally afford to take on some people, it sometimes can be a challenge to just let them go. Let the mistakes happen. Otherwise, you won’t grow. Those are my three biggest challenges of my land career. Steven Butala: My … By leaps and bounds … My number one is the biggest challenge of the three, and it has nothing to do with real estate at all. It has to do with social media and diversification of sales venues on the internet. Generally, if I have to say it in one catchphrase, keeping up with the changes of the internet at the pace of the internet. I was one of these people who never joined Facebook, hated it. Still not the biggest fan on the planet, but it’s really, really useful. There’s so much junk on the social media. It gets such a bad rap, but if you use it correctly like we do and like our members do … I think most of them anyway … It can be the greatest tool there ever was. Really, really efficient and we talk about it all the time now. That by leaps and bounds was the biggest challenge for me. It took like having the rug being pulled out from me for me to like say, “Oh, geez. Let’s regroup.” That was a huge challenge. There’s no way to explain this unless you were buying and selling land between 1995 and 2004. It was impossible to find the property and we all just now take it for granted ’cause of ParcelFact. Jill DeWit: Is that your number two challenge? Steven Butala: Yeah. My number two is finding the real estate. Steven Butala: That’s gone now, and so is social media. My number one problem is gone. My number two problem’s gone. Steven Butala: My third problem has nothing to do with real estate, either, and it’s one that Jill solved a hundred percent was just dealing with customers. Steven Butala: We … It’s not my thing. Sales is not my thing, period. We literally during … Before Jill had no phone number. We would … If anybody had anything to say I would say, “You know what? I don’t really want to hear what you have to say. We’re happy to refund your money.” We were really lucky to be able to generate that much equity with that kind of attitude. I look back on that now and it’s ridiculous. It’s a truly ridiculous attitude to have, even if you have it, and I still have it. I still … I’m telling you, this is what I believe, but instead of being a curmudgeon about it, I just have a good partner. Steven Butala: I split all the money with her and we make … I make way more money splitting 50% of it with her. Jill DeWit: Thank you, and we built a great team. They handle it and they do fantastic. Thank you. Steven Butala: Money’s not a challenge. Steven Butala: Wealth beyond your wildest dreams. Steven Butala: Than that. That’s what this is all about. Steven Butala: Yeah, “I just haven’t saved up enough money for that second or third acquisition.” Or stuff like this. “If I send out 3,000 offers and six of ’em come back and they’re $8,000 each and I don’t have that 50, 60, 70,000 bucks to do it,” okay, stop. Jill DeWit: No. Well, what I found from the first event, I found no money issues. Zero money issues. They were all other issues. Jill DeWit: That’s … We … I think we do a good job telling everybody … I think everybody knows that as you’re starting a business, have some savings no matter what … We all know that. That’s like a no-brainer. You need to be able to whatever it is have the inventory. Whatever you’re gonna … Start a pizza shop, I don’t know. You gotta have money to pay rent and employees and buy the supplies and equipment. What’s so funny? Steven Butala: It’s just funny to hear a woman say, “Have some money, will you?” Will you please have some money? Jill DeWit: We all know that. Steven Butala: Okay, have some money. Hold on, let me get my genie bottle. Oh, hold on, I’m rubbing it. Now, there’s some money. Steven Butala: Now I have some money, let’s get some diamonds. Jill DeWit: No, I’m saying maybe take six months [crosstalk], maybe it takes a year. I don’t care. Steven Butala: Let’s go out to dinner. Jill DeWit: Let’s save up some money so you have the money. Listen, stinker. Anyway, that’s a no-brainer. Most … I really don’t know anybody that comes into this and seriously goes, “Oh, I didn’t know I needed money to do this.” That’s not the case. It’s sort of like, “I’m afraid.” There’s some underlying thing that stops them from pushing the button, getting the mail out there. Sometimes it’s just … Sometimes I think they’re really, really good. They’re afraid to push a button, get the mail out there ’cause they’re afraid the calls are gonna come back. That’s … They’re not afraid of the offers, they’re not afraid of how they did it, not afraid of the precess. They’re afraid of, “Oh shoot, now I’ve gotta answer the phone and do something. Get these people and buy these properties and post them for sale.” Yeah, you do, but it’s okay. Just do it. Do it, do it. It’ll happen. Steven Butala: Wait a minute. Another question for you before we’re done. “What’s the thing that surprised you the most? Every time I start something new I’m like, “Oh boy, I’m really concerned about this’, and then that always ends up being a non-issue but the stuff I was like, ‘Yeah, that’s gonna work out fine’ is like, ‘Oh, this is way harder than I thought. '” In little components, if you break it all down. Jill DeWit: Okay, I know. Steven Butala: With members. What’s the hardest part? The most surprising part? Jill DeWit: Oh, the most surprising part? Okay. The part that surprised me the most was … There’s actually two of them. One … Well, actually it’s all tied into one. What surprised me the most is my conceptions of our customer, our buyers and what they could afford, were not always correct. You cannot assume that someone calling you back … “There’s no way this guy on the phone has $40,000 to buy this property. This guy, I’m sure, he’s just a tire kicker. It’s not true.” Next thing you know he’s wiring you the money. You can’t think like that. The same thing goes true with, “Who’s gonna want this property? It’s so far out here. I can … There’s no way I’m gonna drive out there. Who would want this? Yeah, there’s beautiful trees, but man, it’s on the side of a whatever.” You know what? Watch, here they come. You just put … Do everything that we say and get it out there like we say and advertise it like we say, promote it like we say, all those things, it will happen. They will … Somebody wants it, ’cause you’re getting out there to everyone and you’re gonna find the right person that has the money. Jill DeWit: Crossed your mind? Steven Butala: Never crossed my mind, because that 80,000 dollar property, they just say 80 or 40. Jill DeWit: I bought it for 10 and I’m selling it for 40 ’cause it’s worth 60 or 70 or something. Just the conversation and I know our members have this. It’s kind of funny when it happens to you the first time. When you’re talking to someone and you’re like, “Okay, it’s this much money and you want me to email you my wire instructions? Or how do you want to do this?” They’ll go, “Yeah, go ahead and send it over. I’m gonna move some money on Tuesday and I’ll get it done.” You’re gonna go, “Yeah, right”, and hang up. Steven Butala: Those are the exact conversations that happen. Jill DeWit: You hang up the phone going, “Yeah, right”, and then you send an email and then here comes the bank wire and you’re like, “Holy cow.” It’s funny when that happens the first time. It’s like, “Whoo!” Yeah. Anyway. Steven Butala: My biggest misconceptions by leaps and bounds was the consistent and awe-inspiring availability of ridiculously cheap real estate, and I don’t just mean land. Jill DeWit: Oh, that’s a good one. Steven Butala: To me when I send out an offer, because every single time I send out an offer I’m like, “You know what? There’s a chance this isn’t gonna work.” I have that conversation with myself. Jill DeWit: That’s hilarious. I never think that. Jill DeWit: We always get something. Jill DeWit: Six-month or eight-month period. I mean, [inaudible] offer are still out there. They’re still coming in. Jill DeWit: That’s hilarious. You’re so funny. Steven Butala: We made like almost a quarter mil. Jill DeWit: Exactly. That’s so funny. Steven Butala: Well, you’ve done it again. You spent another 20 minutes or so listening to The Land Academy Show. Join us next time where we discuss how to buy cheap, unwanted land. 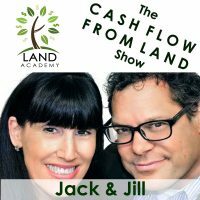 Jill DeWit: We answer your questions posted on our online community at landinvestors.com. It is free. Steven Butala: You are not alone in your real estate ambition. How do you like that for a topic? Steven Butala: That could be Episode what … That’s like Episode 907 or something. Jill DeWit: I like that. That’s really good. Hey, I want to share real quick, it’s Tuesday. Enrollment is open, and there’s a special thing that my team is offering that we’re offering. If you don’t know about it, go check it out on landacademy.com, and wherever you’re watching or listening, please rate us there. We are Steve and Jill.